If you've been waiting for a brand-new photographic experience – this is it. Built from the ground up to offer still image and movie recording without compromise, the incredibly portable Nikon 1 V1 will propel your photography forward in ways you could never have imagined. With the fastest autofocus system (AF) in the world1, four unique shooting modes, brilliant low-light performance and a high-resolution electronic viewfinder, it boasts all you need to capture standout stills and movies. Quick enough to capture the unexpected, the groundbreaking super high-speed AF system instantly switches between Phase-Detection AF and Contrast Detect AF to deliver razor-sharp results in any situation. Phase-Detection AF, which focuses accurately and quickly on movement, is available during movie recording. The camera's clever shooting modes let you shoot scenes as never before and the electronic viewfinder offers 100% frame coverage, even when filming. When you want to use your favourite NIKKOR D-SLR lens, you can do so via the F-mount adapter (the FT 1) that attaches to the camera's 1-mount. Click here for a larger imageEvery one of the compact 1 NIKKOR lenses boasts high-quality optics and is optimised for movie recording. When you want to use your favourite NIKKOR D-SLR lens, you can do so via the F-mount adapter (the FT 1) that attaches to the camera's 1-mount, and the camera's multi-accessory port gives you the freedom to expand your system further. Available in black or white, the Nikon 1 V1 may be small but it's a veritable powerhouse of imaging innovation. With a Nikon 1 in your hand, capturing great images will become second nature in no time at all. Ergonomically designed for comfortable handling and intuitive operation, these intelligent, fully automatic cameras let you shoot any scene with ease. 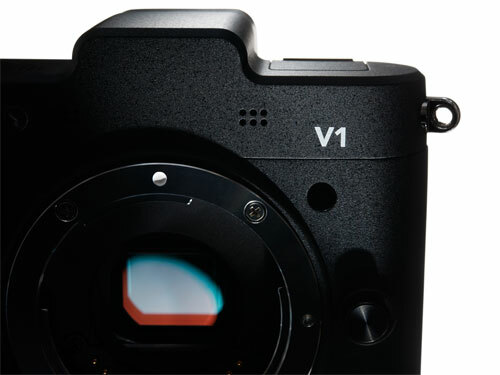 With a strong yet lightweight body and magnesium alloy re-enforced parts the Nikon 1 V1 is robust but remains sleek and small, and with minimal buttons it's easy to become familiar with which ones to use and when. The clear menus feature large, easy-to-understand icons that make it simple to navigate between different functions. A conveniently placed mode dial on the back of the camera offers instant access to a range of clever automatic shooting modes, but with the option for full manual control in both still and movie modes, the Nikon 1 V1 also offers limitless creative options for the more advanced photographic user. Whether you want to shoot fast movement, slow movement or no movement, Nikon's all-new CX-format CMOS image sensor ensures you'll always capture superb high-resolution stills and movies. Developed to offer the ideal balance between speed, light sensitivity, resolution and depth-of-field, you can shoot clearer action shots, better images in low light, and easily soften backgrounds to make your subject stand out more. Equipped with a revolutionary super high-speed autofocus (AF) system that boasts the most focus points in the world3, your subject will always be in focus. If you're shooting shiny or moving subjects, the sensor will switch to Phase-Detection AF. If your subject is stationary, or poorly lit, it will opt for Contrast Detect AF. And whichever system it chooses, the quick shot-to-shot turnaround gives you the freedom to shoot moments as they unfold without worrying about a thing. Every photo is unique, but not many come to life right in front of your eyes. A fantastic way to capture a moment in time as never before, Nikon's unique Motion Snapshot (MSS) makes your photos come alive. Easily accessed via the mode dial, it all happens in just one click. Using its ability to capture images before you fully press the shutter button, the camera simultaneously records a one-second slow-motion movie and a still image. As soon as you've taken your shot it instantly combines the two to create a 'living image'. From the way someone might toss their head before they smile, or someone else might leave the frame before you click, fleeting movements and emotions are captured in a snap. A whole new experience, a Motion Snapshot keeps the story of a moment alive in a way that will delight and amaze you every time you look at it. When it comes to capturing smooth shots of fast action, you need unparalleled levels of speed and precision. With the world's fastest continuous shot5, Nikon 1 cameras have outdone themselves. Engineered to deliver full-resolution images at up to 60 frames per second6, practically no movement will be too fast to capture. And when you want to focus tightly on one subject, the camera can automatically track the subject you've chosen and still capture full-resolution images at 10 frames per second. Whether you want to capture kids or pets as they dash about having fun, or your friends as they whizz about the city on bikes, a Nikon 1 camera will bring a new dimension of speed to every scene you shoot.